Lucky Bamboo is a fascinating houseplant that grows in water. It's great for beginning gardeners. Here you'll find lucky bamboo care tips. 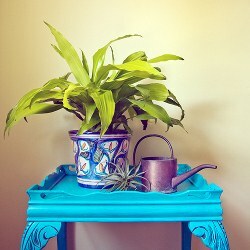 Are you a beginning houseplant gardener? Here’s a great one to get started with because it’s easy as pie to keep looking good and sure to become a topic of conversation as you’re busy showing it off. 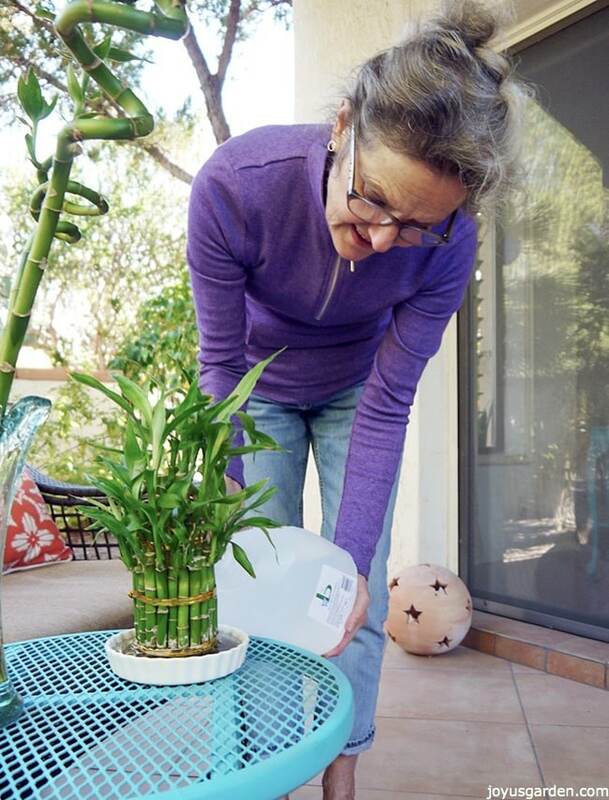 I’d to introduce you to Lucky Bamboo, a plant which grows in water, and give you a few care tips to make sure yours stays as healthy as can be. First off, Lucky Bamboo isn’t a bamboo at all. The canes, stalks or stems (whatever you prefer to call them) resemble the canes of a bamboo plant. It’s a dracaena, Dracaena sanderiana or braunii to be exact. Lucky Bamboo has been a part of Chinese culture for thousands of years but has really skyrocketed into popularity in the past 15 years and is now commonly found in many parts of the world. This is a plant which goes both ways: it grows for the long haul in both water and/or soil. Lucky Bamboo is found in many different forms and arrangements. The number of stalks have different meanings as do the different forms like trellis, tree, spiral, etc. This isn’t something I know a lot of about, but I do know that you should avoid an arrangement using 4 stems. It’s bad luck in the Chinese culture and who needs that? 3 stems is a favorite number because it represents happiness, long life and wealth. Yes please! This arrangement sits in my guest room & hopefully bestows my guests with good luck & fortune. The color of the ties have meaning too. This 1 of mine has gold ties which represents abundance. Lucky Bamboo does great in bright light. It’ll tolerate lower light levels just fine but it won’t grow much. Be sure to avoid putting it in direct, hot sun as it’ll burn baby burn. You may need to rotate your plant so it gets light evenly on all sides. Right now mine sits in a north window sill but I’ll need to move it as the weather heats up because the glass gets hot here in the Arizona desert when those summer days roll around. There is a bit of mixed opinion regarding this. Some people never change water, some change it frequently & others every now & then. I fall into the every now & then category as I change the water about every 2 months. I make sure the water completely cover the roots in both of my arrangements so I add a bit of water as needed, every 2-7 days depending on the temps. If the water is smelling bad, then change it! If your tap water is hard (containing a lot of minerals), then you’ll need to use distilled or purified water. All dracaenas are prone to tipping so if yours is starting to show a lot of brown tips or a build of white in the vase or dish, don’t use tap water. I use purified water now for mine (it costs about a dollar a gallon & lasts for at least 2 months) & I’ve already seen a difference. 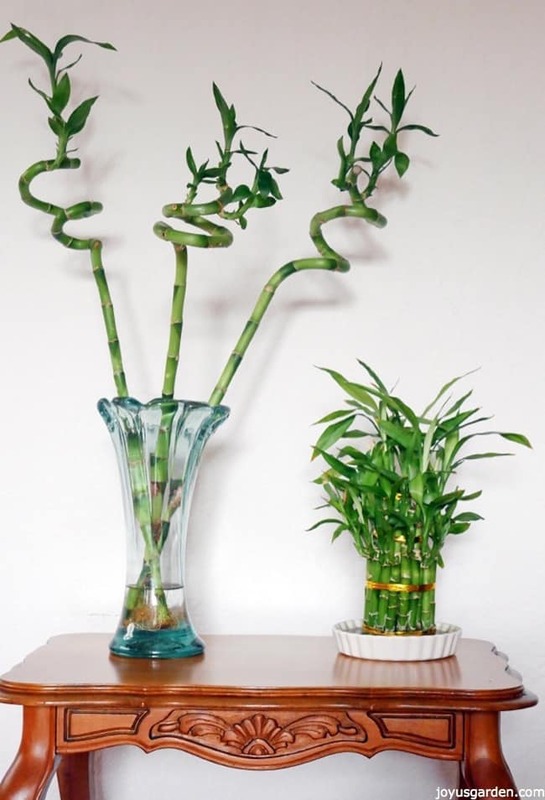 If your Lucky Bamboo arrangement is growing in a low dish or bowl, them make sure it has at least 1″ of space all the way around so the roots can spread out a bit. Mine which has been growing in the low white dish for 3 years now is going to need is going to need a larger vessel soon as the roots are stating to get crowded. My much taller spiral stems are in a glass vase proportionate to their height. I only keep about 3″ of water in the vase, just enough to make sure the roots are fully submerged. 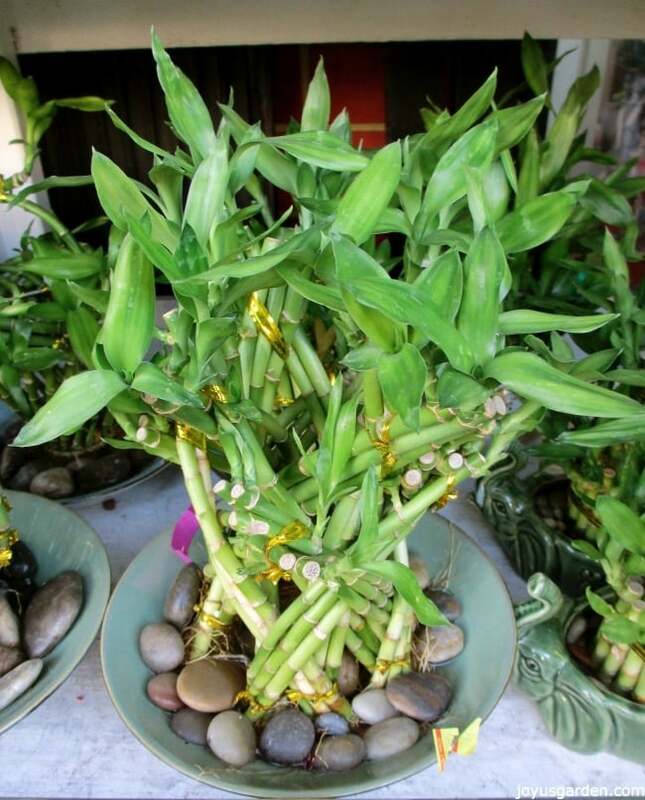 Lucky Bamboo grows just fine & looks great in pebbles, rocks or glass chips. Just make sure those roots stay covered with water. Mine has never gotten any. Like all dracaenas, Lucky Bamboo is subject to an infestation of spider mites, especially in the fall &/or winter when the heat comes on. Also, keep your eye open for thrips, scale & mealy bugs. – Do not place your Lucky Bamboo in direct sun. – Do not use tap water if your water is hard. 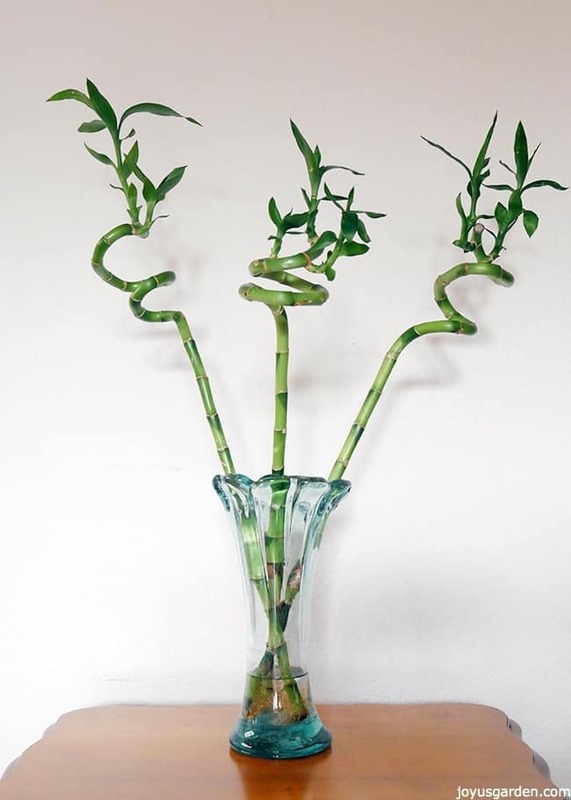 Your Lucky Bamboo will do much better with distilled or purified water. -Do not let your Lucky Bamboo dry out – keep the roots covered with water at all times. -Do not keep the water levels too high – just covering the roots is fine. 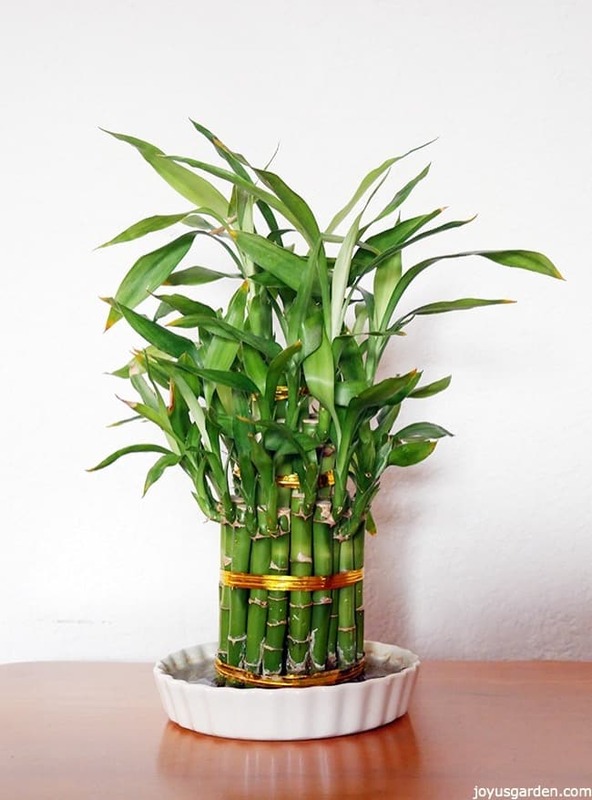 -Do not place your Lucky Bamboo near a heating or cooling vent. Also, keep it away from any cold drafts. -Do not let dust collect on the leaves because the pores need to breath. 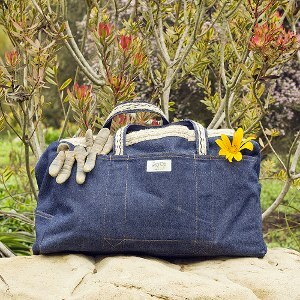 Periodically clean the leaves with a brush, damp rag &/or spray off with water. 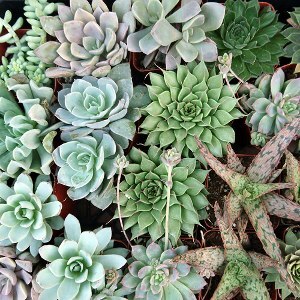 I saw this beautiful arrangement in a shop near Pasadena. The assortment of Lucky Bamboo was impressive! 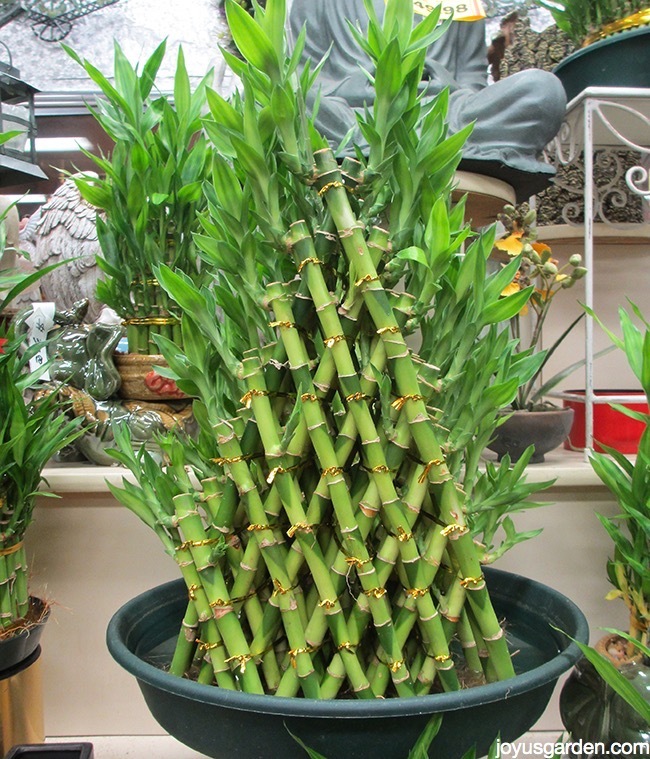 Lucky Bamboo is not only 1 of the easiest houseplants to grow but it’s as fascinating and interesting as a plant gets. If you’re a beginning gardener, be sure to give this 1 a try. I’ve been gardening for over 55 years and I love this plant. And hey, don’t we all need a little luck brought into our homes?!! I love Lucky Bamboo & bought one 5 months ago (I don’t know how to care for a plant but still love it). A week ago, 2 out of 3 stalks starts to turn yellow (not all stalks, just small part of it). I thought it may be because they didn’t get the sunlight. So, I put it under the direct sun for few days. Luckily I saw your tips and quickly retrieve it. Phew!! Btw, thank you for your tips!! It really helps me a lot!! I have three stalks in a glass, straight-sided cylindrical vase. I’m getting algae build-up. The plants are not in direct sun. The water is about 1/4 up the stalks and anchored with clear glass beads. Any thoughts on the algae? Why are my leaves turning yellow but the canes are still green. I repotted it because I saw the roots were starting to come out of the pot, it is growing in rain water only. Is it dying and what should I do. hello Nell. my plant’s leaves turned yellow then i cut them. but now its top is drying n turning into yellow again. pls advise what is wrong? I’m curious! My plant is about 20 inches tall! Can I cut it in half so I’d have 2 stalks? Hi Nell! I’m not really into gardening so I don’t really know what to do with my lucky bamboo plant. I got one from a wedding and I was advised to put it in water – I used tap water. The plant was there for more than a week and I placed it just inside the house. I didn’t check until this weekend. By that time, 80% of the stalk is already yellowish. I really want this plant to survive. Is there still a chance? Any advice, please? I have 2 Lucky Bamboo plants in drinking glasses on my table on my verandah in Thailand. I took them from my garden where they grow naturally, I haven’t counted how many stems are in each glass, but I sure do like them. They get low morning sunlight from the East. The rest of the day they are in shade. UV Radiation perfect. A lovely plant is the Lucky Bamboo. Happiness, Health and Wealth….as they say in China. They definitely work in Thailand. I have a lucky bamboo that is 10 yrs old. And at least 6 ‘ tall. Very hard to keep it standing up. Right now, I have a gardening stake, but I need to replace it because it’s grown past the stake. What do you recommend? Well I am becoming a bit of an expert on Lucky Bamboo. It seems to me they need slightly acidic water on the pH scale. So I am trying a very very dilute lime juice solution in bottled water. Seems to be working fine. And my Lucky Bamboo came from naturally grown plants living and thriving under a canopy of palm trees next door to my Thai Spirit Homes with nobody looking after them. I remain confident of Health, Wealth and Happiness. And the LB definitely looks good. I reckon I could grow an LB in Cupertino. Yep. I do like a hardy low maintenance plant. One of my favourites is Aloe Vera. Looks nice, very low maintenance and the gel that you can extract from the leaves has medicinal properties. First Nation Americans and people in South East Asians have known this for centuries. Quite how the Aloe Vera actually produces the liquid gel given virtually no water is an absolute miracle. A Desert Rose also defies the odds. Keep planting and caring. Without plants the human race would be extinct. how do I clean out the algae in my water bamboo house plant? Just bought a long bamboo & may be cutting it in half or maybe 3 pieces. I don’t have distilled water so I will use tap water & let it sit to remove the fluoride just in case. They will be in a clear vase with clear pebbles et rocks. Is it ok to use seashells? Not sure if I remember correctly that it is a no-no. Hey! I have a question and hope you know the answer 🙂 I have 3 bamboo plants sticks and they are all in 1 vase with water. It’s been a year and their roots started mixing together. Now it looks like 1 plant. Is this okay? Do I need to transfer them to another pot with soil? I have been growing the bamboo plant in soil. My bad!! Can I just take it out of the dirt, wash off the roots, and place in a water vase? I have 2 stalks that I’ve had in a glass vase for a few years now. They don’t seem to grow much! I have a lot of brown at the end of the leaves and the roots are growing up the stocks. I’m guessing that is because I have way to much water in the vase? (About 5″ of water). Should I take the roots down to the bottom, and just leave a little bit of water as you suggested? I live in So. Fla., and move it around, trying to find the best location, but they still don’t seem to get much fuller and taller. Thanks for any advice! 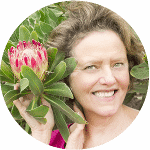 Hi Nancy – Lucky Bamboo isn’t by nature an aquatic plant but it grows in the tropical rainforest where it’s very wet. If you want it for the long haul, it’s best to grow it in soil. As a novelty, it started to be sold as a plant which grows in water & that stuck. They grow in water or soil – not your bad at all! Nell p.s. I’ve never taken one out of soil to grow in water so I don’t know the answer to that. I had a chinese bamboo plant given to me about 6 years ago. It is in a pot which is 2 inches dia. and 3 inches high. It has 2 stalks with 2 stems of foliage on one and 1 on the other. The foliage stems are now twice the height that it was. It sits in a bowl with plenty of room around in my bath it but I only water it about every 5 days and it seems to be doing ok except for the brown tips and your advice to others has helped me out here. It did suffer when I left it with a neighbour for 2 weeks whilst I was away and I didn’t water it for about 3 weeks hoping it would improve – It did. can i do anything to survie it ? I bought a small 3 inch bamboo in a decorative desk vase and my plant was getting way too big, so I put in a large glass vase with rocks, as it grew more the roots broke through the vase, what a mess, it ruined an electrical box due to being on a counter above it. Should I cut the roots back often and if so around how much? I don’t want to hurt the bamboo plant due to it thriving for the last year. I also don’t add soil just rocks and water. I have 2 stalks of lucky bamboo that I bought a few months ago in a little pot with soil. It has always been very healthy looking and grows well, and I water them every now and again with bottled water. Few days ago I noticed the stem of one of the stalk turning yellow right at the top, and the yellowing is slowly spreading downwards and also into the leaves. However the second stem is still a nice healthy green- I’m not quite sure what I can be doing that one stem is fine and the other not so! Not quite sure what to do here! Thank you for any advice. Thank you so much for the post Nell! I’ve been growing a lucky bamboo in soil for a few months not. I tried them just in water with the glass beads a couple of times but they never did well. This one seems to being doing much better. I just have to make sure I use water that’s a little on the acidic side. I searched several sights for information about how to grow them and yours by far is the best. It’s straightforward and concise. Thank you! I was given one and it has a lot of tall leave on it, taller than the plant itself. Should I be cutting them back? I’ve had 8 bamboo in the same vase (in water) for about 10 years now. It’s looks like it’s time to move it into something larger. The roots are so intertwined, I feel that breaking the vase is the only way. Any suggestions? Thanks! I have a LB that came potted in dirt with pebbles on top. Is it possible to remove it from the soil and clean the roots so I can grow it it water? I’ve had much better luck that way! 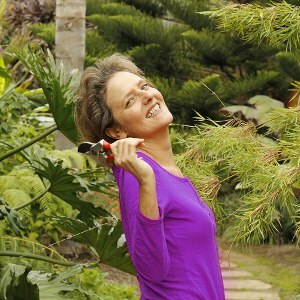 Hello Nell, I have just purchased the Lucky Bamboo. I have never tried them before but always wanted to. I’ve had houseplants about 48 of my 68 years. This one is a challenge. I’m so glad I found your site. Apparently I’ve done everything wrong except the distilled water. I bought 4, bad luck. My question is just to verify because you have mentioned this, too much water. I bought a clear vase but it’s not very tall. I bought a bag of decorative colored round rocks. But to get the bamboo to stand up I put 10 ounces of water. It looks very pretty. But is it too many rocks and too much water for a vase 8tx4wx3d? .Will water rot the stem. I thought it was bamboo until you enlighten us. Thank you so much. Hi I removed one of my stalks from my plant that I have it’s only about 6 inches tall yesterday but it just smelled so bad. now i noticed that one of the taller stalks is turning yellow today. i’ve put my usual amount of water in the pot and i am just hoping it won’t wilt. i just couldn’t handle the smell. Hi, I got a lucky bamboo recently because it was root bound and I wanted to help it. I did, and put it in water. I haven’t even had it for a week and the water started smelling really badly. I’ve heard that you’re supposed to change the water every week, so that concerned me a bit that it hadn’t even been in water for a week yet and it started smelling. So I changed the water, rinsed the pot and rocks. It’s been probably not even a day since I changed the water and it already smells AGAIN. The thing is, though, the plant looks perfectly healthy. It’s green, not browning at all, and the roots look healthy and the stalks are firm. I couldn’t find anything about this anywhere. Maybe you could help? Thanks. Totally off topic, and, I have been enjoying your videos so much, especially houseplants. Being in California drought, I am preferring house plants to outside gardening. My question…….because you relocated to a Tucson from California, how do you like it? I aske because .i am searching for a place to relocate. Any suggestions, ideas, opinions, etc. appreciated. I sent a question on March 27th of this year, but never received a reply. It was a question on repotting. Could you please answer my question. I have three bamboo shoots. I’ve noticed that the tips of the stalks seem to be drying out, as well as by the leaves. There’s also brown spots showing up on the leaves. Is there anything I can do to take care of this? This post may contain affiliate links. Please check our policies here.